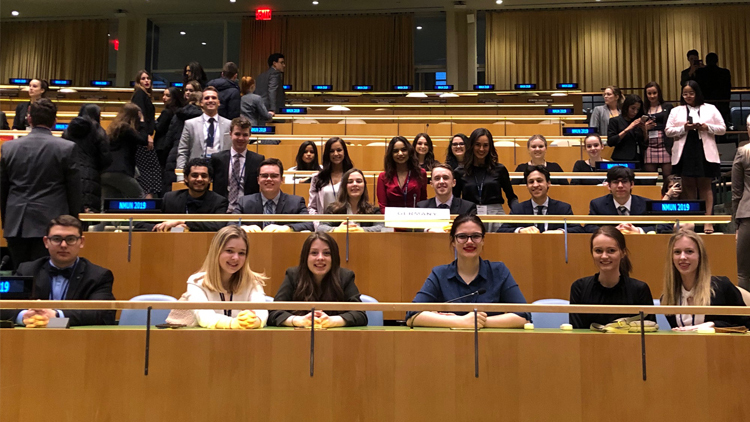 A delegation of 28 StFX students travelled to New York City to participate in the National Model UN (NMUN) Conference. The StFX students won three awards at the event. StFX students once again came away with a very impressive showing from the National Model UN (NMUN) Conference held in New York City March 24-28, winning three awards at the event, the largest intercollegiate MUN conference in the world, drawing over 5,000 students from over 400 universities and 130 countries. Formally recognized by the UN Department of Public Information as a registered NGO, NMUN is also a registered Academic Impact Member of the UN. This year, a delegation of 28 StFX students travelled to New York City to participate. Model UN conferences simulate the activities of the United Nations in proposing, debating, and voting on resolutions on major global issues, with the simulation taking place under various organs and committees of the UN. StFX has a long history of participating in MUN conferences, including the Harvard National Model UN conference, the McGill Model UN Conference, and the NMUN Conference. 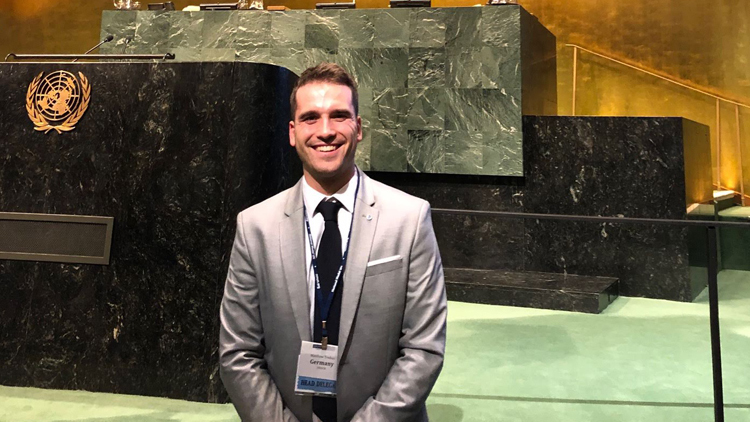 Although this was only the second time for StFX students to attend the NMUN-NY Conference, they came back with three awards—one more than what they won at last year’s conference. Michaella Brand, a fourth year political science honours student, and Chelsea De Kelver, a fourth year religious studies major student, won an Outstanding Delegate Award for their performance in the Human Rights Council; Matthew Trnkus, a fourth year political science honours student, won a Position Paper Award for his pre-conference paper; and the StFX delegation as a whole won an Honourable Mention Delegation Award for their collective performance. In addition to participating in the conference, the students also got a chance to visit the UN Headquarters and participate in a special General Debate session on the Sustainable Development Goals in the UN General Assembly Hall. Mr. Trnkus spoke at the podium on behalf of StFX delegation as its head-delegate. The StFX delegation was led by Matthew Trnkus (president), Rachel MacQueen (vice-president), Nicolas Latulippe (secretary/treasurer), and Patrick Anderson (fundraising chair); and Dr. Youngwon Cho from the Department of Political Science served as the faculty advisor. “Our students’ success is a testament to their dedication and commitment,” says Dr. Cho. “While the conference itself is five days long, the students have been preparing for it for months, engaging in extensive research, learning the rules of procedure, strategizing, practicing speeches, and going through a series of mock sessions leading up to the conference,” he says. “As a student studying political science, I have spent years focusing on international relations and the important role played by international organizations. The opportunity to simulate the United Nations and participate as Germany expanded my knowledge beyond the theoretical into the practical. It is an experience I would recommend to everyone interested in actively participating in improving the global political climate,” says Ms. Brand. 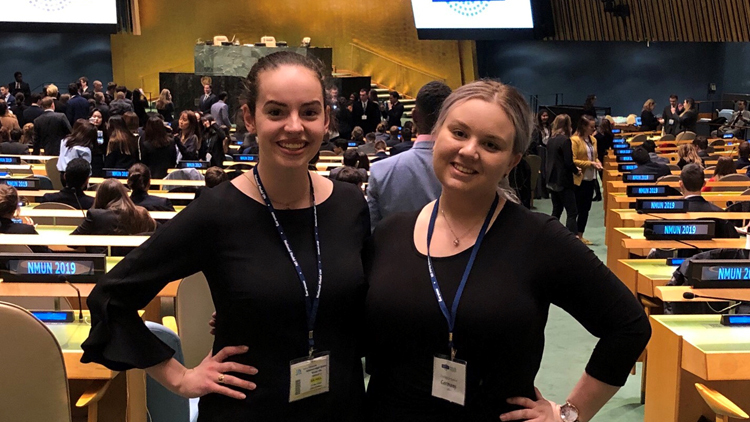 Ms. MacQueen says she is extremely grateful to have had the opportunity to represent StFX at the National Model United Nations Conference in New York City. “Being able to work with thousands of university students from across the world to address critical international issues was an incredibly educational and rewarding experience. Visiting the United Nations General Assembly Hall and being surrounded by other people who are committed to making the world a better place is extremely inspiring,” she says. “Not only does Model UN allow students to learn about international relations and global issues, but it also enables them to enhance their research, diplomacy, and public speaking skills. I really believe that this type of experience is valuable for all students, regardless of the particular field of study they are in or their future career goals. Ms. De Kelver agrees that it was one of the most rewarding experiences she’s ever had. “Learning about international relations in a practical setting and getting to meet so many amazing students was an amazing opportunity,” she says. StFX represented Germany in 17 committees across numerous bodies of the UN, including the First, Second, and Third Committees of the General Assembly, the Security Council, the Economic and Social Council, the UN Environment Assembly, the Peacebuilding Commission, the UN Framework Convention on Climate Change, the World Food Programme, the Human Rights Council, the Office of UN High Commissioner for Refugees, the World Health Organization, UNICEF, the Commission on Crime Prevention and Criminal Justice, the Commission on Population and Development, the UN Industrial Development Organization, and the Special Committee on Peacekeeping Operations. Among the topics addressed were capacity-building for combating climate change in developing countries, nuclear disarmament, external debt sustainability, humanitarian and disaster relief assistance, sustainable production and consumption, marine plastic litter and microplastics, food security, Sustainable Development Goals, restorative justice, international migration, peacebuilding and security sector reform, the Myanmar crisis, gender in peacekeeping operations, access to safe drinking water, refugee settlement, protection of children with disabilities, mental health in humanitarian crisis, and many more. This year’s conference participation was made possible in part by the generous funding provided by the Jules Leger Endowment, the Bloomfield Family Endowment, the Mulroney Institute of Government, the Department of Political Science, the Dean of Arts, and the McKenna Centre for Leadership. Students interested in joining the StFX team for next year’s conference and committed to its continued success should contact Dr. Cho at ycho@stfx.ca.